SIXTY EIGHTH CONGRESS. SESS.I. Ch. 185, 190. 1924. Be it enacted by the Senate and House of Representatives of the United States of America in Congress assembled, That this Act may be cited as the "Immigration Act of 1924" Sec. 2. (a) A consular officer upon the application of any immigrant (as defined in section 3) may (under the conditions hereinafter prescribed and subject to the limitations prescribed in this Act or regulations made thereunder as to the number of immigration visas which may be issued by such officer) issue to such immigrant an immigration visa which shall consist of one copy of the application provided for in section 7, visaed by such consular officer. Such visa shall specify (1) the nationality of the immigrant; (2) whether he is a quota immigrant (as defined in section 5) or a non-quota immigrant (as defined in section 4); (3) the date on which the validity of the immigration visa shall expire; and such additional information necessary to the proper enforcement of the immigration laws and the naturalization laws as may be by regulations prescribed. b. The immigrant shall furnish two copies of his photograph to the consular officer. One copy shall be permanently attached by the consular officer to the immigration visa and the other copy shall be disposed of as may be by regulations prescribed. c. The validity of an immigration visa shall expire at the end of such period, specified in the immigration visa, not exceeding four months, as shall be by regulations prescribed. In the case of a immigrant arriving in the United States by water, or arriving by water in foreign contiguous territory on a continuous voyage to the United States, if the vessel, before the expiration of the validity of his immigration visa, departed from the last port outside the United States and outside foreign contiguous territory at which the immigrant embarked, and if the immigrant proceeds on a continuous voyage to the United States, then, regardless of the time of his arrival in the United States, the validity of his immigration visa shall not be considered to have expired. (d) If an immigrant is required by any law, or regulations or orders made pursuant to law, to secure the visa of his passport by a consular officer before being permitted to enter the United States, such immigrant shall not be required to secure any other visa of his passport than the immigration visa issued under this Act, but a record of the number and date of his immigration visa shall be noted on his passport without charge therefor. This subdivision shall not apply to an immigrant who is relieved, under subdivision (b) of section 13, from obtaining an immigration visa. (e) The manifest or list of passengers required by the immigration laws shall contain a place for entering thereon the date, place of issuance, and number of the immigration visa of each immigrant. The immigrant shall surrender his immigration visa to the immigration officer at the port of inspection, who shall at the time of inspection indorse on the immigration visa the date, the port of entry, and the name of the vessel, if any, on which the immigrant arrived. The immigration visa shall be transmitted forthwith by the immigration officer in charge at the port of inspection to the Department of Labor under regulations prescribed by the Secretary of Labor. (f) No immigration visa shall be issued to an immigrant if it appears to the consular officer, from statements in the application, or in the papers submitted therewith, that the immigrant is inadmissible to the United States under the immigration laws, nor shall such immigration visa be issued if the application fails to comply with the provisions of this Act, nor shall such immigration visa be issued if the consular officer knows or has reason to believe that the immigrant is inadmissible to the United States under the immigration laws. (g) Nothing in this Act shall be construed to entitle an immigrant, to whom an immigration visa has been issued, to enter the United States, if, upon arrival in the United States, he is found to be inadmissible to the United States under the immigration laws. The substance of this subdivision shall be printed conspicuously upon every immigration visa. 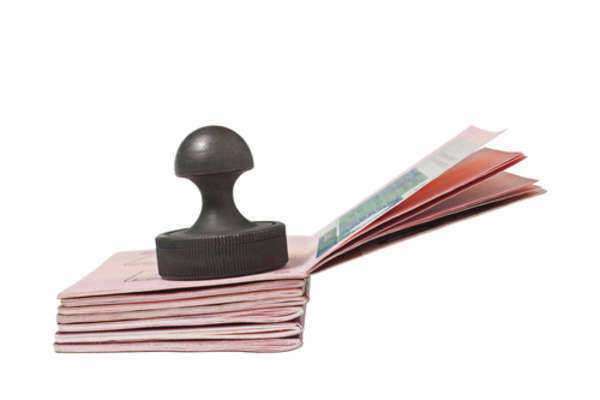 (h) A fee of $9 shall be charged for the issuance of each immigration visa, which shall be covered into the Treasury as miscellaneous receipts. DEFINITION OF IMMIGRANT. SEC. 3. When used in this Act the term "immigrant" means an alien departing from any place outside the United States destined for the United States, except (1) a government official, his family, attendants, servants, and employees, (2) an alien visiting the United States temporarily as a tourist or temporarily for business or pleasure, (3) an alien in continuous transit through the United States, (4) an alien lawfully admitted to the United States who later goes in transit from one part of the United States to another through foreign contiguous territory, (5) a bona fide alien seaman serving as such on a vessel arriving at a port of the United States and seeking to enter temporarily the United States solely in the pursuit of his calling as a seaman, and (6) an alien entitled to enter the United States solely to carry on trade under and in pursuance of the provisions of a present existing treaty of commerce and navigation. NON-QUOTA IMMIGRANTS. SEC. 4. When used in this Act the term "non-quota immigrant" means- (a) An immigrant who is the unmarried child under 18 years of age, or the wife, of a citizen of the United States who resides therein at the time of the filing of a petition under section 9; (b) An immigrant previously lawfully admitted to the United States, who is returning from a temporary visit abroad; (c) An immigrant who was born in the Dominion of Canada, Newfoundland, the Republic of Mexico, the Republic of Cuba, the Republic of Haiti, the Dominican Republic, the Canal Zone, or an independent country of Central or South America, and his wife, and his unmarried children under 18 years of age, if accompanying or following to join him; (d) An immigrant who continuously for at least two years immediately preceding the time of his application for admission to the United States has been, and who seeks to enter the United States solely for the purpose of, carrying on the vocation of minister of any religious denomination, or professor of a college, academy, seminary, or university; and his wife, and his unmarried children under 18 years of age, if accompanying or following to join him; or (e) An immigrant who is a bona fide student at least 15 years of age and who seeks to enter the United States solely for the purpose of study at an accredited school, college, academy, seminary, or university, particularly designated by him and approved by, the Secretary of labor, which shall have agreed to report to the Secretary of Labor the termination of attendance of each immigrant student, and if any such institution of learning fails to make such reports promptly the approval shall be withdrawn. EXCLUSION FROM UNITED STATES. SEC. 13. (a) No immigrant shall be admitted to the United States unless he (1) has an an unexpired immigration visa or was born subsequent to the issuance of the immigration visa of the accompanying parent, (2) is of the nationality specified in the visa in the immigration visa, (3) is a non-quota immigrant if specified in the visa in the immigration visa as such, and (4) is otherwise admissible under the immigration laws. (b) In such classes of cases and under such conditions as may be by regulations prescribed immigrants who have been legally admitted to the United States and who depart therefrom temporarily may be admitted to the United States without being required to obtain an immigration visa. (c) No alien ineligible to citizenship shall be admitted to the United States unless such alien (1) is admissible as a non-quota immigrant under the provisions of subdivision (b), (d), or (e) of section 4, or (2) is the wife, or the unmarried child under 18 years of age, of an immigrant admissible under such subdivision (d), and is accompanying or following to join him, or (3) is not an immigrant as defined in section 3. (d) The Secretary of Labor may admit to the United States any otherwise admissible immigrant not admissible under clause (2) or (3) of subdivision (a) of this section, if satisfied that such inadmissibility was not known to, and could not have been ascertained by the exercise of reasonable diligence by, such immigrant prior to the departure of the vessel from the last port outside the United States and outside foreign contiguous territory or, in the case of an immigrant coming from foreign contiguous territory, prior to the application of the immigrant for admission. (e) No quota immigrant shall be admitted under subdivision (d) if the entire number of immigration visas which may be issued to quota immigrants of the same nationality for the fiscal year already been issued. If such entire number of immigration visas has not been issued, then the Secretary of State, upon the admission of a quota immigrant under subdivision (d), shall reduce by one the number of immigration visas which may be issued to quota immigrants of the same nationality during the fiscal year in which such immigrant is admitted; but if the Secretary of State finds that it will not be practicable to make such reduction before the end of such fiscal year, then such immigrant shall not be admitted. ( f ) Nothing in this section shall authorize the remission or refunding of a fine, liability to which has accrued under section 16. DEPORTATION SEC. 14. Any alien who at any time after entering the United States is found to have been at the time of entry not entitled under this Act to enter the United States, or to have remained therein for a longer time than permitted under this Act or regulations made thereunder, shall be taken into custody and deported in the same manner as provided for in sections 19 and 20 of the Immigration Act of 1917: Provided, That the Secretary of Labor may, under such conditions and restrictions as to support and care as he may deem necessary, permit permanently to remain in the United States, any alien child who, when under sixteen years of age was heretofore temporarily admitted to the United States and who is now within the United States and either of whose parents is a citizen of the United States. MAINTENANCE OF EXEMPT STATUS. SEC. 15. The admission to the United States of an alien excepted from the class of immigrants by clause (2), (3), (4), (5), or (6) of section 3, or declared to be a non-quota immigrant by subdivision (e) of section 4, shall be for such time as may be by regulations prescribed, and under such conditions as may be by regulations prescribed (including, when deemed necessary for the classes mentioned in clauses (2), (3), (4), or (6) of section 3, the giving of bond with sufficient surety, in such sum and containing such conditions as may be by regulations prescribed) to insure that, at the expiration of such time or upon failure to maintain the status under which he was admitted, he will depart from the United States. SEC 28. As used in this Act- (a) The term "United States," when used in a geographical sense, means the States, the Territories of Alaska and Hawaii, the District of Columbia, Porto Rico, and the Virgin Islands; and the term "continental United States " means the States and the District of Columbia; (b) The term "alien" includes any individual not a native-born or naturalized citizen of the United States, but this definition shall not be held to include Indians of the United States not taxed, nor citizens of the islands under the jurisdiction of the United States; (c) The term "ineligible to citizenship," when used in reference to any individual, includes an individual who is debarred from becoming a citizen of the United States under section 2169 of the Revised Statutes, or under section 14 of the Act entitled "An Act to execute certain treaty stipulations relating to Chinese," approved May 6, 1882, or under section 1996, 1997, or 1998 of the Revised Statutes, as amended, or under section 2 of the Act entitled "An Act to authorize the President to increase temporarily the Military Establishment of the United States," approved May 18, 1917, as amended, or under law amendatory of, supplementary to, or in substitution for, any of such sections; (d) The term "immigration visa" means an immigration visa issued by a consular officer under the provisions of this Act; (e) The term "consular officer" means any consular or diplomatic officer of the United States designated, under regulations prescribed under this Act, for the purpose of issuing immigration visas under this Act. In case of the Canal Zone and the insular possessions of the United States the term "consular officer" (except as used in section 24) means an officer designated by the President, or by his authority, for the purpose of issuing immigration visas under this Act; (f) The term "Immigration Act of 1917" means the Act of February 5, 1917, entitled "An Act to regulate the immigration of aliens to, and the residence of aliens in, the United States"; (g) The term "immigration laws" includes such Act, this Act, and all laws, conventions, and treaties of the United States relating to the immigration, exclusion, or expulsion of aliens; (h) The term "person" includes individuals, partnerships, cor porations, and associations; (i) The term "Commissioner General" means the Commissioner General of Immigration; (j)The term "application for admission" has reference to the application for admission to the United States and not to the application for the issuance of the immigration visa; (k) The term " permit " means a permit issued under section 10; (l) The term "unmarried," when used in reference to any as of any time, means an individual who at such time is not married, whether or not previously married; (m) The terms "child," "father," and "mother," do not include child or parent by adoption unless the adoption took place before January 1, 1924; (n) The terms "wife" and "husband" do not include a wife husband by reason of a proxy or picture marriage.